Launch rockets to destroy bricks at each level in this incredible breakout game. Outrageous 3D graphics, new brick types, and intense special effects will amaze. Install this game and you won't go outside for a week! Great jigsaws are a Shockwave.com tradition. Solve a new puzzle every day! Hint: You just click the Dart button to make the sheep sleep. Gish isn't your average hero, in fact he's not your average anything.. see Gish is a ball of tar. A Sunday stroll with his lady friend Brea goes awry when a shadowy figure emerges from an open man hole and pulls Brea into the ground below. Following Brea's calls for help Gish suddenly finds himself in the subterranean sewers of Dross, a long forgotten city filled with twisting corridors, evil traps and some of the most demented creatures imaginable. With his gelatinous structure as his only means of defense Gish must follow the echoing cries of his damsel in distress deep into the earth bellow. What freakish creatures dwell in this subterranean land? Who is Brea's captor? And just how far down does the rabbit hole go? Demo of the 3D aventure game The Moment of Silence. Includes the prison island section. Players step into the role of Peter Wright, an advertising executive currently heading up the Government’s ‘Freedom of Speech’ campaign. When a heavily armed SWAT team storms his neighbor’s apartment, Peter must uncover the truth behind his mysterious disappearance as he becomes drawn in the deceptive worlds of corruption and power. Battle breakout is sure to be an entertaining challenge to up the ante for any fan of block breaking games like Ricochet. 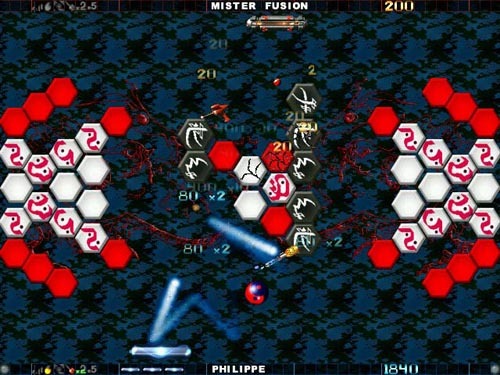 You square off against a computer opponent or online challenger to score the most points and move on to successively more difficult levels. Campaign mode lets you face newer more challenging competitors with each successive victory. A username and password are required for online play and posting of high scores to the online hall of victory. Six different arenas with over 150 levels and a combination of animated paddles are sure to keep your block breaking skills honed. Power-ups provide the upper hand for the opponent who claims them. The sound effects are clever. The graphics are everything you'd expect from your favorite flavor of Ricochet. The first sixty minutes are free always. Inspector Parker returns to solve an entirely new type of murder mystery. Use your action puzzle skills and your smarts to move through an English castle defusing booby traps, examining clues and interrogating suspects. BeTrapped! features 37 rooms to inspect and more than 1400 puzzle combinations to solve. Crack the case today! * New pieces: Power gems, hyper cubes and more! Sometimes you just want to explode! Now you can — literally — as Goro. Use your exploding power to take out the bad guys who hunt you down. Play it today — it's a blast! Only your quick reflexes to save the day! Grab your bike and go downhill today! * Reach speeds of over 100 mph! Best of all, you can play online right away. No lift lines or expensive lift tickets! If you want to do a quick crossword puzzle or two... or over 32,000 of them, here's where to go! Cosmic Bugs takes its cue from the addictive classics Jezzball and Qix. But that's where the similarity ends, because Cosmic Bugs has different shapes for each level, 3D rendered graphics, digital sound, new enemies, and tons of power-ups. The game features over 500 levels, and does not require any special hardware. It's easy to control and easy to play! Game play is free for the first sixty minutes. Size 769.3MB Note: If you don't have a broadband connection, don't bother downloading this demo. It's a huge file. Like its predecessor, you take the role of Gordon Freeman, and this time earth is infested with aliens. It was your fault (remember Black Mesa?) and now it's down to you to rescue everybody. This demo features some of the earlier levels of the game, and gives you a preview of a later area known as Ravenholm. Above is the link to the main site where you can download trials of games. HERE you will find the online Playable versions of some of them. HipSoft is creating free online web versions of our most popular games! We'll be adding more soon! Build pipelines to guide flows of soda. 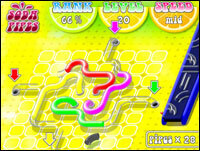 Soda Pipes is different from similar themed games as several flows may be running at the same time and a flow may divide into sub flows. This allows for a more varied gameplay as fascinating twisty mazes of pipes can be constructed as well as regular one way pipelines. The tightly focused one-piece-at-a-time gameplay remains intact though. Fans of another minimalistic puzzle classic, Tetris, should feel right at home. Don't take our words for it, check the reviews so far! Help Ozzy to discover stolen talismans in outrageous underwater world! Help Snowy to guide Green Pals to the rocket! Run past the Green and he will follow Snowy. Rack up a super score by collecting a long chain of Greens! Kick items like handcarts and dustbins to defeat monsters and collect as much bonuses as you can!!! * 80 levels of non-stop fun! * Four different Game Worlds with original items, bonuses and monsters. * Cartoon-style graphics and smooth animation. * Nice dynamic special effects. * Special KIDS FRIENDLY MODE. * Many different ways to score, keeps a good replay value! * More music, more effects, more cartoons, more fun!!! Glimmer Games announced that the first two titles to be published by the new label will be Anime Bowling Babes and Kick Shot Pool. Both games are available for purchase on the publisher’s website, also trial versions of the games are available for download. Glimmer Games will also be publishing the action-puzzle title Pop-A-Holic. The nice thing about Glimmer Games titles is that you a 30-day money back guarantee.